There were, of course, as is always the case with Rash, moments of genius that leave indelible marks. Where the novel gains weight is in the brief flashbacks to Les’ and Becky’s pasts, and how these two damaged but resilient human beings were shaped by tragic events. At one point, Les remarks on what pushed them together, with a sense of dark 21st century wit, commenting on what their online dating profiles might’ve read: “Man who encouraged clinically depressed wife to kill herself seeks woman, traumatized by school shooting, who later lived with ecoterrorist bomber.” One wishes there was more of this peppered throughout the mostly dour, albeit intermittently gorgeously grim, proceedings. There’s another brilliantly rendered episode involving a raid on a meth house that uncovers a (thankfully alive) baby sleeping in a microwave. Rash builds the suspense wonderfully (what awaits them in that house? is the thing in the microwave alive?) while making one feel as if they could smell, see, and feel the same things the police officers did as they entered the house. 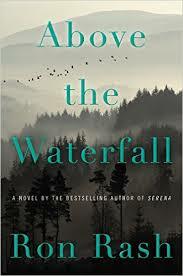 But it’s how he paints the emotional aftermath of the discovery on a young deputy that grips the reader’s heart. Rash uses an interesting bookend device…poetically obtuse descriptions of ancient cave paintings left behind in French caves, hinting at what not only Les and Becky, but also the colorful stock side characters, wish to leave behind. The most famous of those well documented cave paintings is simply the stamp of a human hand…the classic case of less being more in art. It’s a singular, bold declarative statement to people who would look at it 30,000 years later: I was here. With Above the Waterfall, Rash continues to make his etchings of Appalachian life in the 20th and 21st centuries, staking his claim for generations to come as the Bard of Asheville. This entry was posted in Book Reviews, Books, Literature and tagged Above the Waterfall, Appalachia, Bard of Asheville, Meth, Mountains, North Carolina, Novels, Ron Rash, Southern Gothic.